The Xybots are dead. Long live the Xybots! Well… yeah. Who likes it when a plan falls apart? This blog was originally established to chronicle technical hurdles encountered while planning, practicing, and ultimately playing a live show of songs I have written over the years. It was to be based on the journey towards making such a show happen- but it looks like that journey got a little longer. 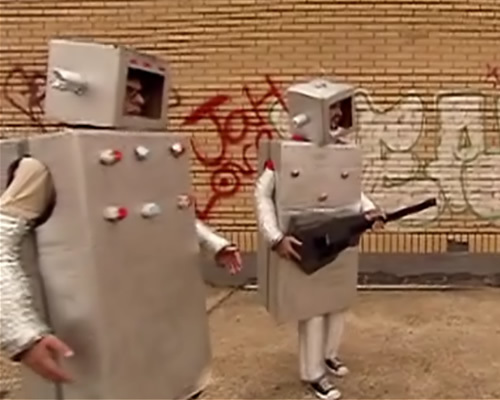 Saturday, October 16th 2010 was to be the first Xybots live show. But it didn’t happen. The official last straw was a band member’s flu illness a couple of days before the show- the last tidal wave sent forth from a sea of mishaps. From a lack of pre-show band practices, to some very creative theories on what commitment means (my favorite was someone showing up for practice after a few beers- minus their instrument- on the wrong night)… it became clear that we would not be ready to play in time. In the beginning, it crossed my mind that having to cancel the show for any reason would be really disappointing. The day I cancelled it, the strongest sensation I could feel through the fog of recent sleep deprivation was relief. It was a bummer to have to contact everyone at the last minute to tell them the show was called off (along with the party I planned around it, since we would be playing at my house). But in the end, that’s what happened. Where to go from here? I’m definitely not ready to try and plan another live show. But I did learn a few things, and picked up a few tricks along the way. I may take a break from music for awhile, but I’m sure I’ll get back to composing eventually.